With a legion of fans, both old and new, comedy duo Cheech Marin and Tommy Chong have a built-in audience for their new animated feature, Cheech and Chong’s Animated Movie. After all, the film offers a trip down memory lane for those who enjoy their stoned antics. Essentially plotless, old routines from Cheech and Chong comedy album have been animated and strung together for a total of 83 minutes. The link between each vignette is Buster the Body Crab, a pubic louse who we meet during the opening segment (living in a woman’s crotch). He follows the guys around, jonesing for a contact high at the very least. How much interest does this weed-infused, R-rated film hold for general audiences? Probably not a whole lot. There are some amusing bits of tasteless bawdiness for those with a broad sense of humor, even for those who choose to watch sober. But it’s worth mentioning that much of this material is simply dated, in terms of cultural touchstones) and may not register with viewers under 30. Younger audiences who didn’t grow up with Cheech and Chong have been inundated with stoner humor, which long ago ceased being edgy, underground stuff and moved into the mainstream. That said, these routines (including the game show parody, “Let’s Make a Dope Deal,” and a bit with Cheech and Chong as dogs, “Ralph and Herbie) are basically good-natured and carry an air of quaint, yesteryear nostalgia that make them relatively easy to sit through. True fans will appreciate the wealth of information contained in the three Blu-ray commentaries. The first one features Marin and Chong discussing the background of the vintage sketches included in the film. They’re out-of-character and taking the track seriously, reminiscing about the material (though the track is not without humor). Co-directors Branden and Eric Chambers sit with producer Lou Adler for the second track, which is obviously more geared toward elaborating on choices made during the production. Lastly, and perhaps most interesting, there’s a track with just Chong and his son, Paris. There’s some good material here, with Chong discussing at length the legal trouble (which also involved Paris) that landed him in a federal prison in 2003-04. The bold, candy-colored animated looks pretty great in this sharp Blu-ray transfer. The animation style is deliberately simple, dominated by lots of straight lines, static backgrounds, and primary colors. But regardless of the look, it is presented very solidly. 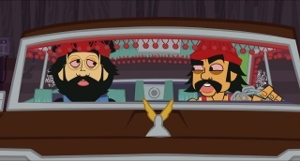 The 5.1 DTS-HD MA soundtrack consists largely of the original audio used from old Cheech and Chong recordings. It’s clear and easy to understand though, largely lacking any indicators of its age. The rock music that pops up from time to time, while still largely front-centric (like the dialogue), carries solid, resonant bass. 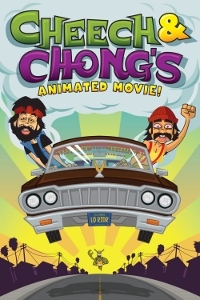 Cheech and Chong’s Animated Movie is also available on DVD.